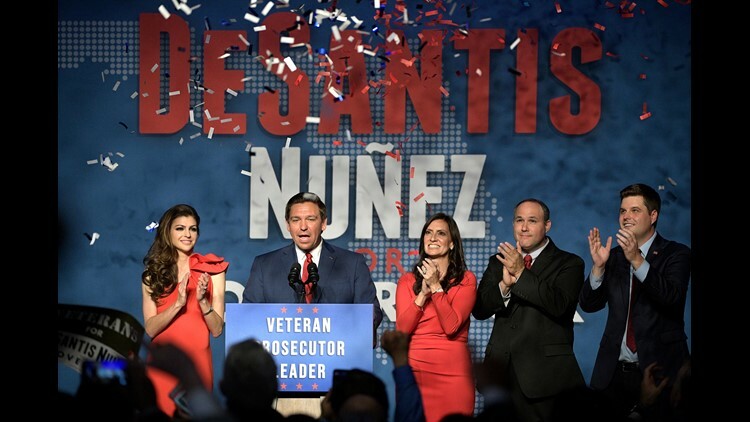 Florida Gov.-elect Ron DeSantis, second from left, thanks supporters with his wife, Casey, left, Lt. Gov.-elect Jeanette Nunez, center; her husband, Adrian Nunez, second from right, and Rep. Matt Gaetz, R-Fla., after being declared the winner of the Florida gubernatorial race at an election party Tuesday, Nov. 6, 2018, in Orlando, Fla.
Florida's secretary of state ordered a recount Saturday afternoon for three statewide races, including the governor and U.S. Senate contests. The margins in all races remain well under the half-percent needed to automatically trigger a machine recount. More than 8 million votes will be recounted. In the race for governor, Republican Ron DeSantis led Democrat Andrew Gillum by fewer than 34,000 votes or a margin of .409 percent, with all counties reporting as of 12:35 p.m. Saturday, according to the Florida Division of Elections. Gillum conceded on Tuesday night, though the race has since tightened. On Saturday, Gillum reversed his concession amid the recount. "Let me say clearly, I am replacing my words of concession with an uncompromising and unapologetic call that we count every single vote," Gillum said in a Saturday news conference. "I say this recognizing my fate in this may or may not change." During a Thursday night news conference, Scott announced he is suing the Palm Beach and Broward County supervisors of elections, saying “there may be rampant fraud” in the counties that heavily favor Democrats. He’s asked the Florida Department of Law Enforcement to investigate. The agency said it was not investigating because it had received no evidence of fraud. In heavily Democratic Broward County, evidence points to a combination of possible problems: voting machine errors, badly crafted ballots and some voters who skipped certain races on the ballots. Broward County sent its first round of unofficial voting results to the state Saturday, but Republicans expect it to include ineligible votes mixed in with accepted ballots. The mistaken ballots were discovered Friday night after Broward elections chief Brenda Snipes presented the provisional ballots to the canvassing board. The board discovered at least 20 ineligible ballots were mixed into the pile. Republican candidate for state agriculture commissioner Matt Caldwell and his campaign committee filed suit Friday against Snipes seeking to stop the counting of ballots that were not in hand when the polls closed. Meanwhile, the Florida Democratic Party has accused Caldwell of trying to interfere with legal ballot counting. Caldwell is down by 5,326 votes or a margin of .06 percent in his race against Nikki Fried.